Some of Nibiru’s moons have arranged themselves into what has become known as the String of Pearls, following each other in a line, which when seen from the side look like a pearl necklace. These showed up in late 2003 and early 2004 when Nibiru arrived in the inner Solar System, putting on the brakes as it approached the Sun so that the vast tail of Nibiru wafted toward and past the Sun. Thus they were visible at that time. ZetaTalk Description 6/15/1997: Planet X's moons travel like a string of pearls behind the monster traveling planet and a great deal of trash has also been caught, from boulders to gravel to dust that drags long behind as the giant comet's tail. ZetaTalk Description 2001: Thus, the moons of Planet X, having assumed a swirl that perpetuates itself, remain in a dance behind Planet X even during its dither point between its two foci. Planet X moves, however slowly, at its dither point, so the swirl is always positioned between Planet X and the foci it is leaving. This swirl, unique to man in any comets or planets it observes, is what caused the ancients to call the passing monster, red in the sky because of its illuminated red dust cloud, a dragon, lashing its tail, the swirl of moons. 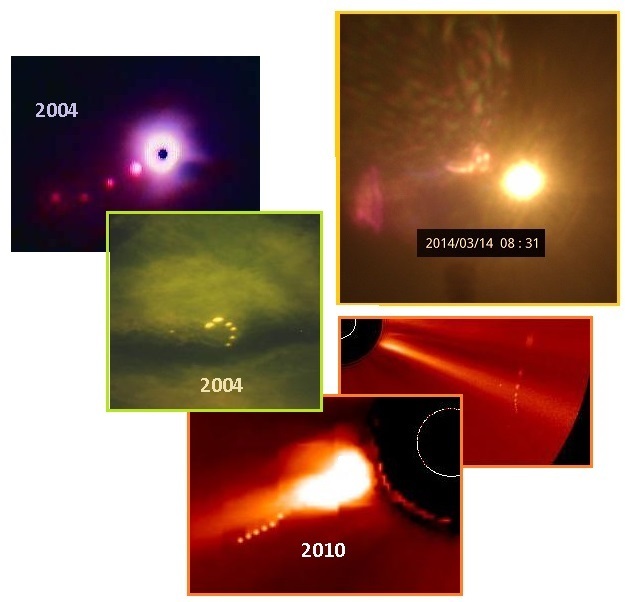 Then the String of Pearls seemed to disappear, except for showing up in 2010 in NASA’s SOHO images or in the Stereo Ahead or Behind images, which have a view less impeded by the charged tail dust gathered between and clinging to the Earth and Nibiru, both of which are magnetic planets. Between 2004 and 2014, the String of Pearls seemed to disappear, likely due to better editing of the SOHO images so streaks were allowed but the moons themselves were not discernable. Until recently, when in 2014, Alberto, the master of the red filter, began to occasionally capture the String of Pearls. Now, suddenly, the String of Pearls has become visible naked eye again. They were seen on the horizon in Norway at sunrise on October 5, captured by Alberto on November 17, and seen by a group of hunters in Missouri at sundown on October 20. The string hung like a pearl necklace above, 12 Moons clearly visible. A break in the clouds where the setting Sun shown through had exactly 12 spires of light pointing down into the Missouri River below. The image was examined by experts who were unable to explain the phenomena. But the Zetas explain. 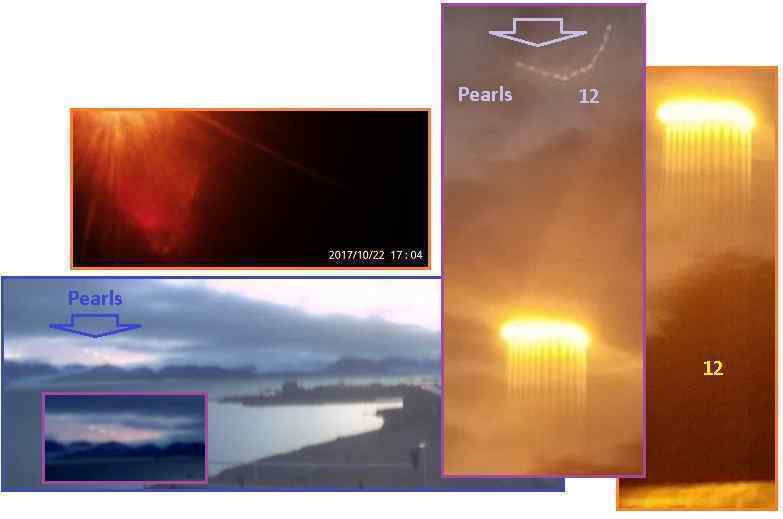 ZetaTalk Comment 11/30/2017: The String of Pearls made an appearance in the early days of Nibiru’s descent into the inner solar system, in 2003-2004, as it was either on the opposite side of the Sun or at a distance from the body of Nibiru itself and the Moon Swirls were able to reflect sunlight back toward Earth. Then the String of Pearls showed up in 2010 on the SOHO and Stereo Ahead and Behind satellite images, because Nibiru had come closer to the Sun during its passage and was able to reflect more brilliant sunlight toward the cameras, and NASA was not on guard and thus not erasing this from their images. The Zetas have long predicted that the great Eurasian Plate would rip open during the plate movements affecting it from the East to the West. There is much evidence of stretch stress in Europe, being pulled to the West as the Atlantic spreads, and certainly the plate is being pushed toward China though the intense subduction at Tibet is a block there. The Zetas describe this rip in the Eurasian Plate as opening a new inland bay, from just west of Karachi up toward the Ural Mountains. ZetaTalk Prediction 11/22/2014: The Eurasian Plate is solid, though under stretch stress from one end to the other, from Europe to the shores of China. We have predicted a new seaway ripping up toward the Ural Mountains, though this rip will not occur until the hour of the Pole Shift. 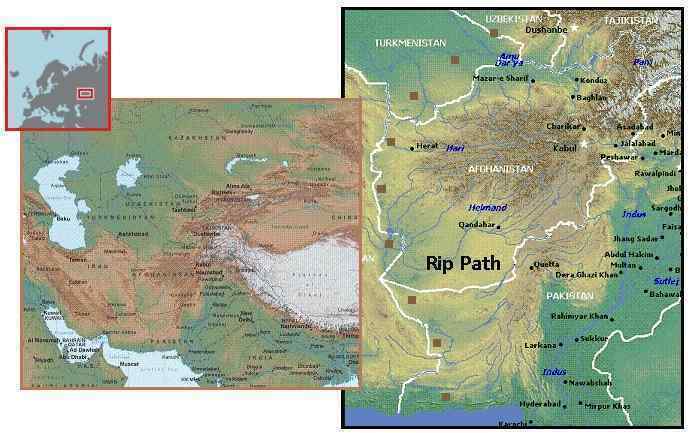 The seaway will rip along the western border of Pakistan and Afghanistan, and aim toward the low lands just to the east of the Ural Mountains. This region has ripped before, as the geology shows. Now yet more evidence pointing to this rip line has emerged, during the investigation of a RU 106 radiation leak suspected of coming from a Russian nuclear waste disposal site that lies along the rip line. The RU 106 site was almost precisely along the rip line predicted by the Zetas. Unlike the Iodine 131 leak that occurred in 2016, which affected all of Europe, this RU 106 leak was admitted by Russia. The Iodine 131 radiation came from active power plants, found throughout Europe, and per the Zetas the profit motive kept the press silent about the source of the leaks. ZetaTalk Comment 11/30/2017: Clearly the leak of Ruthenium 106 came from nuclear waste facilities and clearly this was from the Agrayash region in the Southern Ural Mountains. 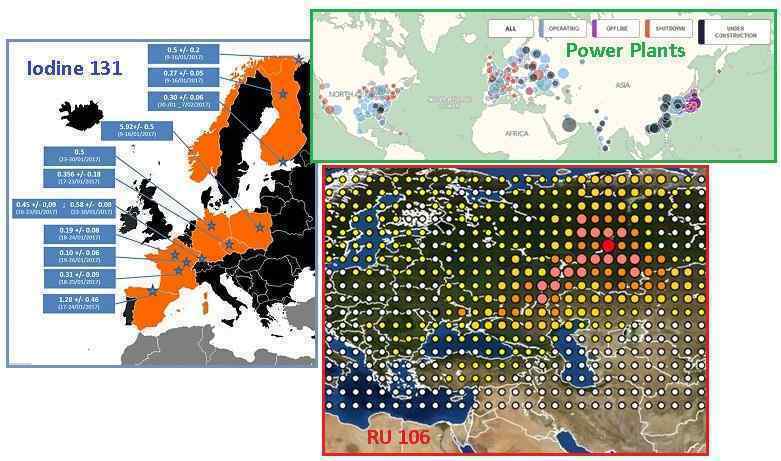 Just as the culprit during the Iodine 131 release that flooded Europe in February, 2017 was never admitted by any facility, there is reluctance by Russia to admit fault during the harmless release of Ruthenium 106. The European leak was from active power plants, which affect profits of the elite if forced to shut down, where the Russian leak is from waste facilities which are a taxpayer drain, not a profit making enterprise. Thus, fault is being admitted. There is more than the stretch of the Eurasian Plate responsible for this most recent leak. The stretch has started the process of tearing open a new bay from just west of Karachi up to the Southern Urals. Precisely where the containment failure occurred. This stretch and rip is essentially silent, though the release of methane and resulting brilliant explosion in the Urals astonished commuters in the dark early morning hours. Nuclear facilities, in all stages, are built primarily of concrete, and regardless of how reinforced this will crack and allow leaks. More disasters await, primarily in Europe and in the US. Russia has always been more open and honest about Nibiru and the alien presence, as the admissions about radiation leaks shows. They are preparing, moving to the Far East which will not only be high ground but tropical in the Aftertime. 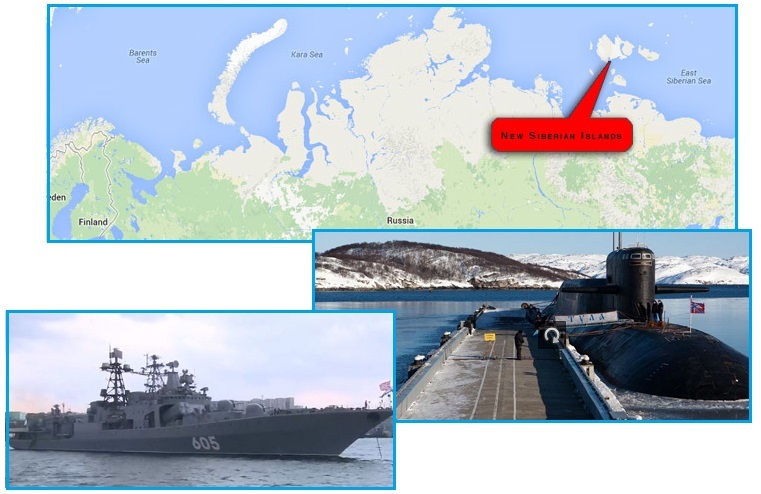 Russia has moved their state offices there, setup a new naval station in the New Siberian Islands, and is giving away free land to citizens who move there. ZetaTalk Comment 7/31/2017: Russia has always been more open about the alien presence and the pending passage of Nibiru, while stopping short of admitting publicly or officially that Nibiru exists. What has happened that Russia is now taking a bolder stance? On February 4 a Russian astronomer stated that a bolide was from the trash in the tail of Nibiru. The cover-up over the presence of Nibiru is in its death throes. There is the increased visibility, where the Second Sun is making an appearance and being filmed, setting the Internet abuzz. There is the Earth wobble, what the “Main Meteorological Organization” in Russia is calling an axis tilt, so that the Sun rises and sets where it ought not on a daily basis. Almost simultaneous to the RU 106 admission, the Russian Patriarch Kirill made a compelling speech, basically saying that the world is in the End Times predicted in the Book of Revelations. He mentions, without being specific, things that can “already be seen with the naked eye”. What else can this be but the Nibiru complex, in its many forms seen in the sky, and the Earth wobble so papable when the Sun is not in the right place at sunrise or sunset. Per the Zetas, he is encouraging the people of Russia work together to prepare. ZetaTalk Comment 11/30/2017: Where the Patriarch Kirill described the current times as those depicted in the Book of Revelations, he was also chiding politicians. Without citing Nibiru directly, he noted something that could be “seen with the naked eye” and an “approach”. What is it that politicians and others are doing to march mankind “towards the abyss”? They are insisting on the status quo, and pretending that the Earth changes are not going to destroy their current comfortable life. Floods and devastating earthquakes, bankrupt corporations and the banking system defaulting – all this awaits. Rather than a blind march toward the abyss, Patriarch Kirill is suggesting that the politicians and the citizenry of Russia, “who love the Motherland”, take responsibility for plotting a different path. 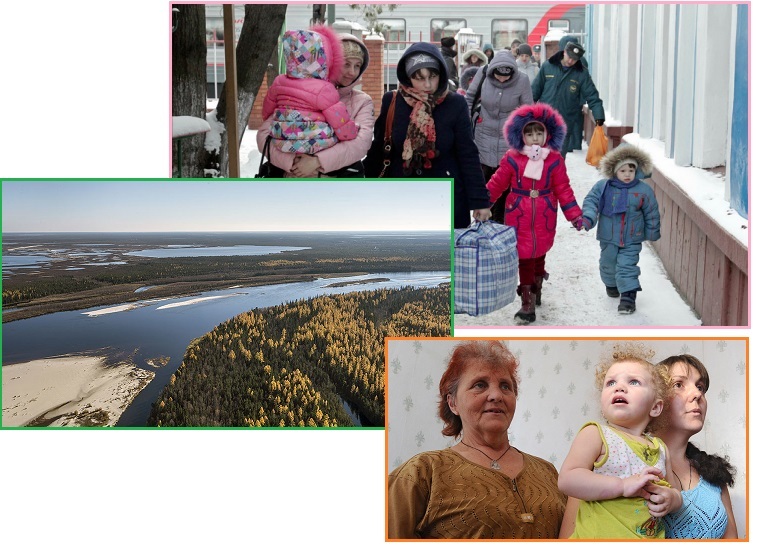 Of course Putin has placed Russia on that path already, by providing free land to those who move to Russia’s Far East and by moving the State Offices from Moscow to the Far East. 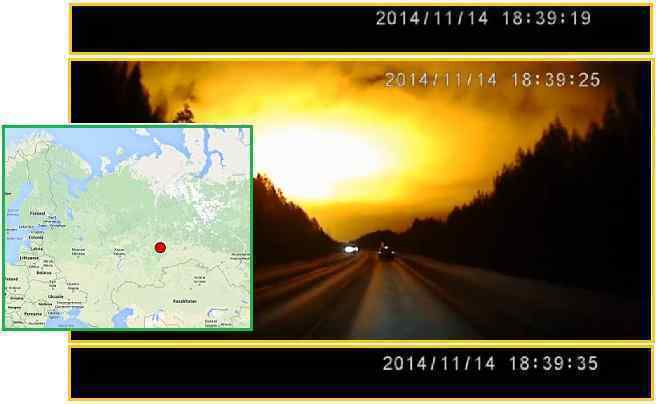 Is Patriarch Kirill’s speech the start of an official announcement regarding Nibiru? We have implied that Russia will lead in these admissions about Nibiru, and yes, this is the start. 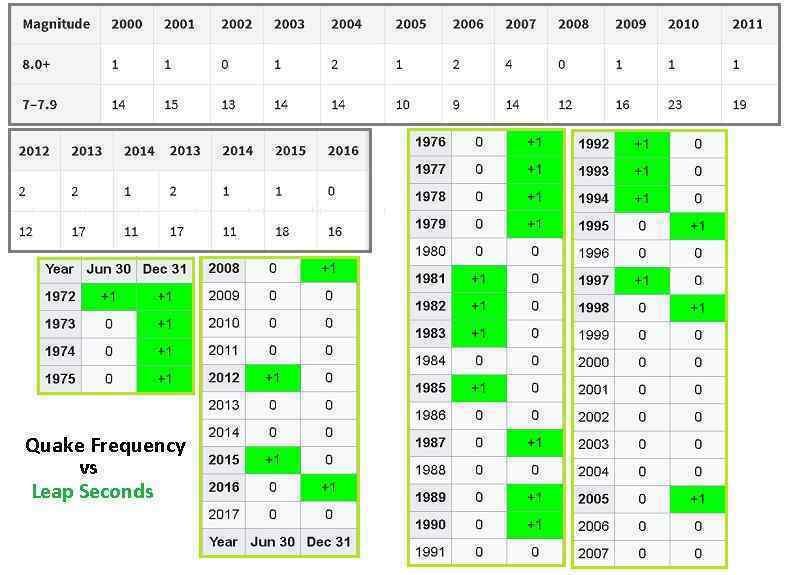 Earthquakes are on the increase to the extent that even with reducing the magnitude, and deleting quakes from the databases to disguise the frequency, the charts still show a phenomenal increase. Various excuses were used, such as claiming reporting was only showing an increase because more seismographs were in place, or blaming the quakes on fracking. Earthquakes of course continued to rise in magnitude and frequency, as have booms from snapping rock. Oops, time for the cover-up over the presence of Nibiru nearby to step in and step up. Anything but Nibiru is the explanation, per the Zetas. Was it a supersonic aircraft? A meteor? A ground explosion? The end of the world as we know it? Those are the questions experts and non-experts around the world are asking themselves in recent weeks as curiously loud mystery BOOMS have not only been hear around the world, but felt – shaking buildings and rattling nerves from Alabama to Michigan, Idaho to California, Russia to Denmark. 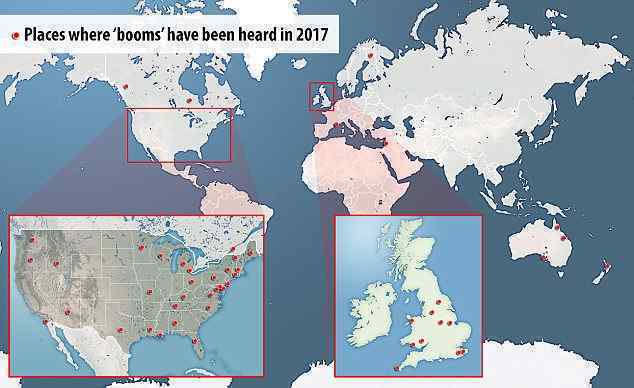 Reports continue to emerge of booming sounds of mysterious origin echoing from the sky, from Colorado and Alabama to the Middle East, United Kingdom and Australia. Their source has thus far defied scientific explanation. Now we have yet another explanation for the increase in earthquakes. It is Leap Seconds. Every time the Earth slows down a tad, which it has regularly been doing as the Leap Second chart shows, this apparently causes earthquakes, or so says a theory presented to the Geological Society. This theory was so compelling that major media felt the need to put it into print. Yahoo, RT, the Guardian, and Live Science featured this silly theory. The data does not comply however, in fact it shows the opposite trend – fewer Leap Seconds, but more earthquakes. 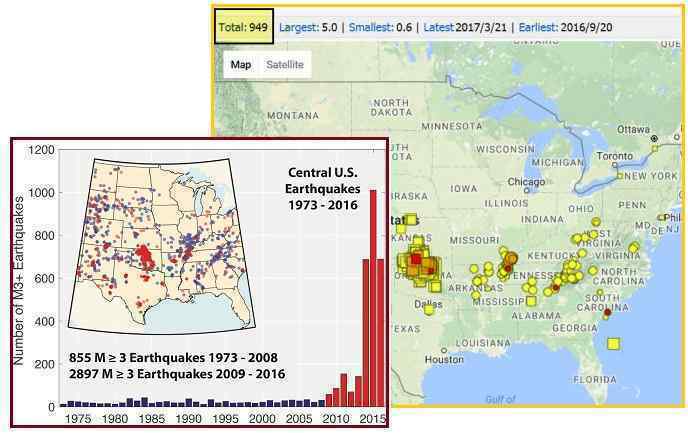 Past periods of slow rotation over the last 100 years have coincided with more earthquakes than average, according to research presented last month at the annual meeting of the Geological Society of America. The basic idea is that as the Earth's spin slows slightly, the equator shrinks. More powerful earthquakes could rock the globe in 2018 because of infinitesimal changes in the speed of the Earth’s rotation. Historical data since 1900 clearly reveal a “strong” link between major global earthquake activity and a slight slowing of the Earth’s rotation for five or six years. ZetaTalk Comment 11/30/2017: Once again we have current Earth changes such as plate movements and earthquakes ascribed to “anything but Nibiru”, as Nancy likes to say. Now the increase in earthquakes is supposed to be caused by a slight global slowdown, based on statistics from the past. How nebulous is this? Researchers can ascribe earthquakes happening anywhere in the world, in any Richter scale, with any frequency over a period of 4-5 years and decide this is due to a miniscule slowdown of a millisecond in rotation. Never mind that the numbers don’t line up.